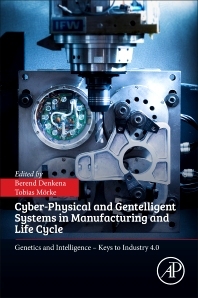 Cyber-Physical and Gentelligent Systems in Manufacturing and Life Cycle explores the latest technologies resulting from the integration of sensing components throughout the production supply chain, and the resulting possibilities to improve efficiency, flexibility, and product quality. The authors present cutting edge research into data storage in components, communication devices, data acquisition, as well as new industrial applications. Detailed technical descriptions of the tools are presented in addition to discussions of how these systems have been used, the benefits they provide, and what industry problems they could tackle in the future. This is essential reading for researchers and production engineers interested in the potential of cyber physical systems to optimize all parts of the supply chain. Manager of collaborative research centre 653, at the Institute of Production Engineering and Machine Tools at Leibniz University, Hannover, Germany. The focus of CRC 653 is on the integration of components with their corresponding information for reproduction as well as corresponding stress information from their lifecycle.